Today’s post is with the power house “Nellikai/Amla/Gooseberry”. The first thing which strikes my mind about nellikai is its taste. It has all the taste except salty flavor. The common practice to consume this berry is to sprinkle them with salt and have a sip of water, they taste sweet !! . 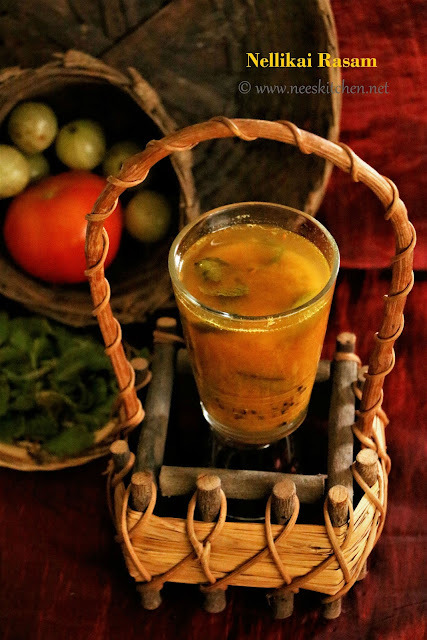 “Nellikai Rasam | Gooseberry Soup | Amla Rasam” is a good way to get Vitamin C in your daily diet as nellikai do not lose none of the Vitamin C nutrition while cooking. Nellikai is available for us throughout the year in the market, however the best way to preserve them is by soaking them in salt water which can then be used throughout the year. Some of them add turmeric for preserving purposes. There are 3 varieties of nellikai available in the market, the one which I have used for “Nellikai Rasam | Gooseberry Soup | Amla Rasam” is the banarasi variety which is bigger in size. 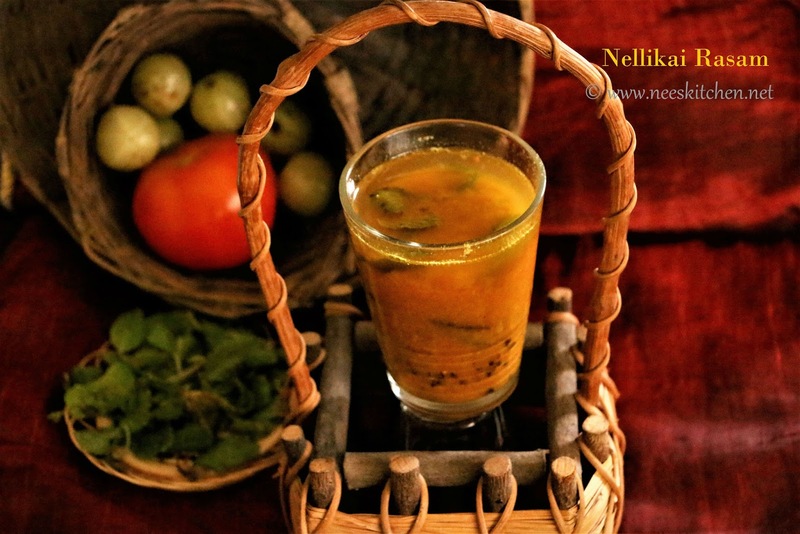 The taste of the Nellikai Rasam would slightly change based on the variety used. Adjust the quantity of nellikai if you are using a different variety. 5. Good for Diabetic Control as it simulates the body’s ability to produce insulin. 6. Good for anemia as the iron content maintains good blood circulation and blood regeneration. Amla/Nellikai/Gooseberry (Banarasi Variety)- 2 nos. 1. To begin making the Nellikai Rasam, break the nellikai into wedges. You would notice some fine lines running from top to bottom cut the nellikai by following these lines. Discard the seeds. 2. Take a mortar and pestle, add nellikai,1 inch sliced ginger, green chili & salt. Grind them to a fine paste without adding any water. 3. Chop tomato into fine pieces, place in blender with 1 cup water. Tomato juice is ready, keep it aside. 4. Take a kalchatti or stainless steel bowl, add hing cake, curry leaves, ground nellikai paste, tomato juice, water & turmeric. Mix well and bring to a boil. Continue to boil for 8 to 10 minutes. 5. Add rasam powder and continue to cook on medium high for another 7 -8 minutes until it becomes frothy. 6. 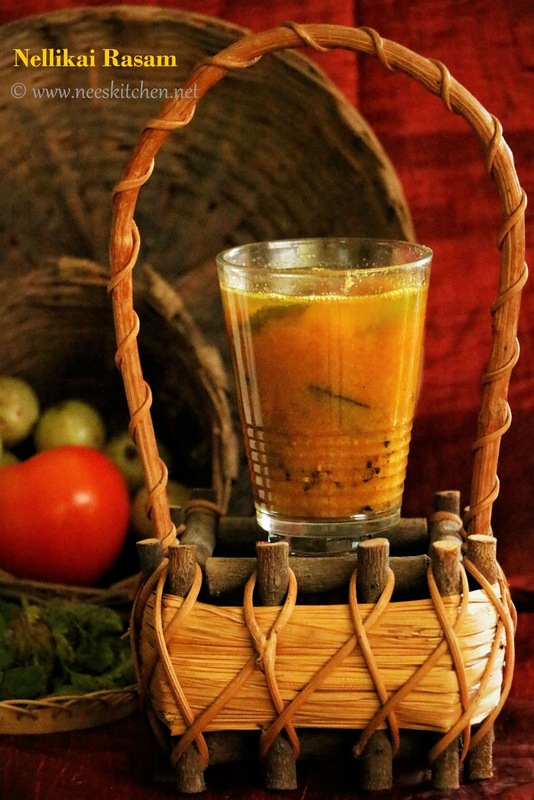 While the rasam is simmering, prepare the tempering. Heat ghee in a small pan, add mustard seeds and as they splutter, add one dry red chili & cumin seeds. Once the cumin seed is fried, add mint leaves and sauté for few seconds. 7. Heat oil in a heavy bottomed vessel, add a generous pinch of hing. Once the hing is fried, add mustard seeds and as they splutter add urad dhal, channa dhal , green chili & ginger. Sauté until the green chili and ginger are cooked. 8. Pour the tempering to the simmering rasam. 9. Close with a lid and allow the rasam rest for a few minutes before serving.